Which operating system for the Raspberry Pi Who has the choice,Which operating system or Linux distribution should one use? That is the question. The answer, it depends. Below is a recommendation. Who has the choice,Which operating system or Linux distribution should one use? That is the question. The answer, it depends. Below is a recommendation. 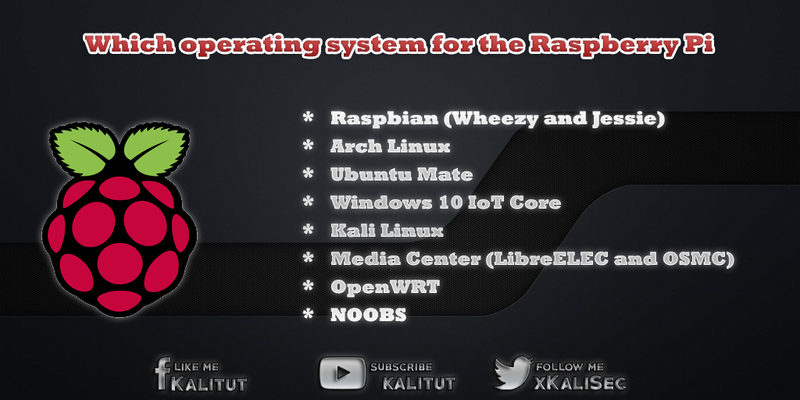 The official operating system for Raspberry Pi is the Linux distribution Raspbian. It comes with the best and latest hardware support. In addition, many important and useful programs for experimenting and learning are already pre-installed. Beginners can not go wrong with Raspbian. Even for advanced users, it is the first choice. Ubuntu Mate for Raspberry Pi is based on the popular Linux distribution Ubuntu in combination with the MATE desktop. The optimized for Raspberry Pi Ubuntu version should be the first choice, if you want to use the Raspberry Pi as a desktop computer. Arch Linux is a very fast operating system, without much frills. If you like working with the command line on Linux, then Arch Linux is an option. LibreELEC is a media center distribution based on Kodi optimized for speed for different hardware. Many things are just "plug and play". And others are easier to implement than with OSMC. It's a good choice to set up a media center on Raspberry Pi. OSMC is a media center distribution based on Kodi. However, it comes with its own user interface, which is very easy to use. OSMC is very easy and quick to install. In principle, Kodi is just a user interface that can be installed independently in Raspbian. This is an alternative if you want to keep using the Raspbian desktop. Windows IoT is a special case that is usually out of the question. Regular applications for the Windows desktop do not work here. This operating system only makes sense if you are native to the Windows world of programming and want to integrate programs and controls into the Windows world on a slimmed-down hardware platform. NOOBS is not an operating system, but a boot manager. It provides an easy way to install and test a Linux distribution on the SD memory card. However, such an installation is not suitable for permanent use. Especially beginners should leave the fingers of NOOBS and install Raspbian or another operating system. This avoids unpredictable problems caused by NOOBS. In principle, getting the image of a Linux distribution from Raspberry Pi Foundation website is always a good idea. You should make sure that you choose a distribution that is suitable for the version of Raspberry Pi on which you want to use the distribution. Experience has shown that making life unnecessarily difficult when using other, especially scaled-down or special distributions. Then you have to adjust to unexpected problems that you do not have with a standard distribution.